Factual error: When the donor is wheeled in for surgery to harvest her organs there are no signs of life support, no tubes, no IV, not resporator. A donor must be kept "alive" by life support or the organs will die. 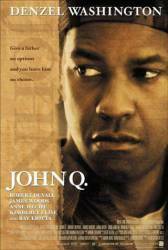 Factual error: There is a scene where John Q's son whispers to him with a breathing tube down his throat. It is physically impossible to speak, even whisper, with a breathing tube. Trivia: The message "For Sasha" which appears just before the end credits is a dedication to director Nick Cassavetes' daughter. Trivia: The scene where George W Bush is speaking about health care while John and Denise are watching TV there is also shot with footage of Al Gore because the election was between the time of shooting and release.